Ron Miller, the author of such hits as "Touch Me in the Morning" and "For Once in My Life," has died at 74. Miller died Monday of cardiac arrest at Santa Monica UCLA Medical Center after a long battle with emphysema and cancer, daughter Lisa Dawn Miller said. He got his professional start in the music business in the 1960s, when Motown founder Berry Gordy saw him perform at a piano bar and invited him to Detroit as one of the label's first songwriters and record producers. 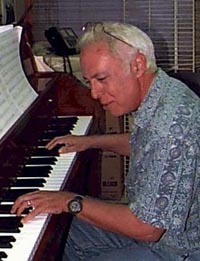 His songs have been recorded by many leading artists, including Judy Garland, Stevie Wonder, Diana Ross and Ray Charles. "For Once in My Life," written with Orlando Murden, is one of the most recorded songs in history, with more than 270 versions, according to All Music Guide. A rendition by Tony Bennett and Wonder won a Grammy award this year. In 2005, Charles' and Gladys Knight's version of Miller's "Heaven Help Us All" picked up the best gospel performance Grammy. Born in Chicago, Miller was a die-hard Chicago Cubs fan who wrote his first sad song as a child about his beloved but hapless professional baseball team, his daughter said. Before meeting Gordy, Miller made ends meet by selling washing machines and taking odd jobs. He also served in the Marines.